Following our recent walk down the Kilburn High Road, we took a similar walk up West End Lane. 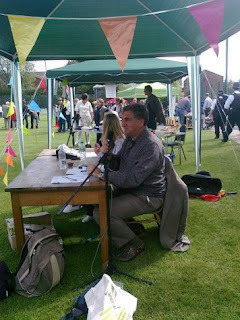 Joining us was John Saynor, chair of WHAT (West Hampstead Amenity and Transport), which takes a keen interest in these matters too. We didn’t really focus on the litter situation, because – dare I say it – it seems a bit better, although we aren’t counting our chickens, or the discarded fried chicken containers. 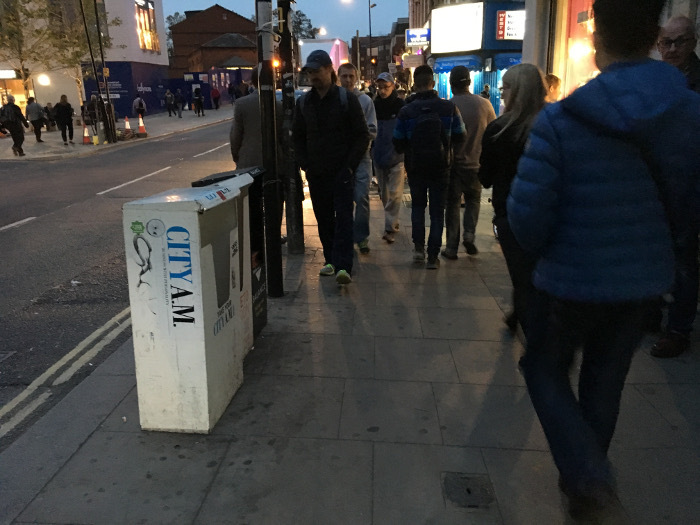 Instead, we focused on the street clutter and particularly the A-boards that can obstruct pavements. Without getting too technical (and with apologies for those who read the KHR piece), I’m going to introduce the word ‘curtilage’ at this point. This means the space between your property and the public highway, but which is still your land. Within reason you can do what want – deck it, put up an A-board or set out goods for sale. However, if any of these activities take place on the public footpath then people have the right to be miffed. In fact it’s a planning infringement that must be rectified. 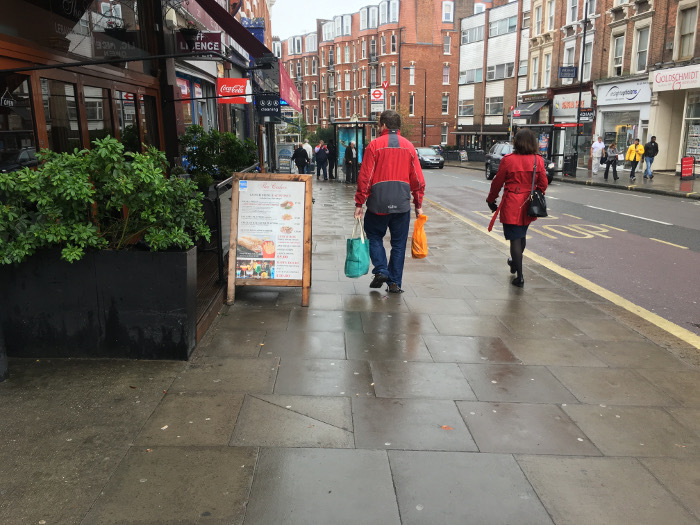 A well maintained high street keeps the pavement clear and makes sure that it is wide enough for pedestrians (including those with buggies, or in wheelchairs) to pass in opposite directions. 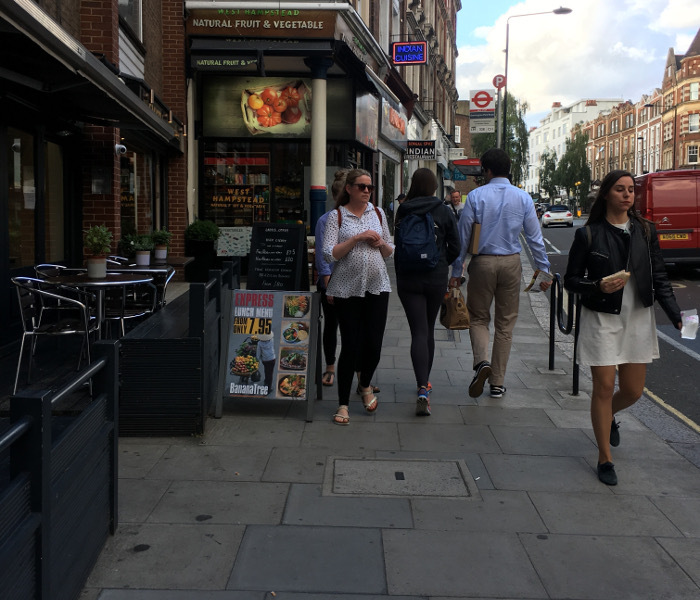 There are London planning standards for this – the pedestrian comfort guidance, which recommends a minimum of 3 metres width for a busy pedestrian pavement like West End Lane. Of course shop-owners put their A-boards out to try to grab some extra custom, a manager might change and not realise the rules (implicit or explicit) or a contractor will put out warning signs and leave them, so there needs to be regular vigilance to ensure that pavements don’t get overrun with signage or other commercial undertakings. However, the situation is not always clear-cut. At some points the pavement is narrow and any obstruction is a potential hazard, at others it is wide and it’s not such a problem. The width of the curtilage also varies, so at some points, a shopkeeper can put out an A-board but in others, where there is no curtilage they can’t, which can seem ‘unfair’. With all this in mind, we started our walk by the stations. For years, locals have been campaigning to ensure that the pavements around and between the stations are widened and kept clutter free to ensure easy (and safe) movement of pedestrians. There have been improvements over recent years, but the recent attempt by a phonebox company to install some phone boxes here would have undone all the hard work. Thankfully Camden turned the application down. The situation will also be improved when the Overground station is finished as it will be set much further back, removing a dangerous pinch point on the pavement. Outside the tube station, we spotted these freebie newspaper containers. They don’t look great and cause a certain amount of disruption to pedestrians in a busy section. In the past, they have been removed, but they seem to be creeping back. Who is responsible for sorting this out? WHAT takes an interest in these matters, but is it anyone’s responsibility to report infringements? Is it the role of the Neighbourhood Development Forum? What about the thousands of local commuters who walk past daily, or the local councillors, or street cleaners or community police officers? We asked the local councillors about this and Cllr Lorna Russell replied that the Council do rely on members of the public to flag issues as they can’t have eyes and ears everywhere. However, many people don’t know what needs reporting and even if they do, don’t know how best to report it. Likewise, the councillors themselves report things – they are avid users of the Clean Camden app. Sometimes an issue can be dealt with by having a quiet word. Other times official action is needed and the council has to take charge. Here is a good example. This redundant sign (from the Overground crane works) was left there throughout the week even on the very narrowest sections of pavement. A quick call to the Overground building works team got agreement to store them during the week. Success! It’s since reappeared 🙁 and now sits off to one side. Next up we cross the road to Banana Tree. The restaurant has just lost an appeal and will have to remove its decking. The pavement is not terribly narrow here, so some will judge this a little harsh. 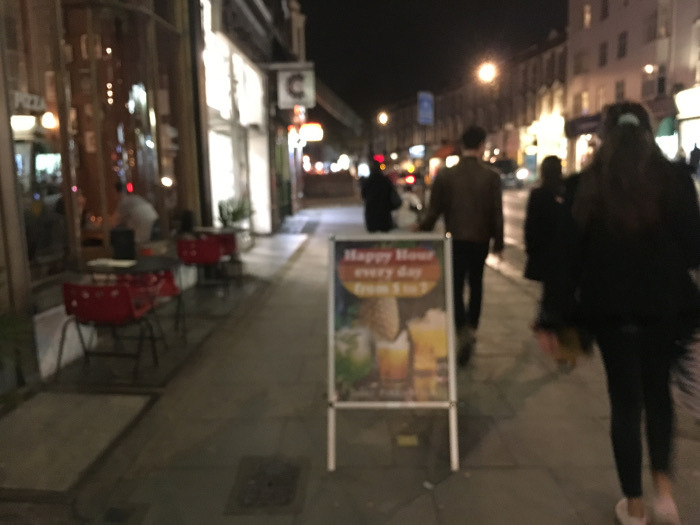 However, the restaurant’s A-board does narrow the pavement further. As a rule of thumb, you’re not going to get an A-board and decking on your curtilage, you have to pick one. And it’s not clear where Banana Tree’s curtilage is, if it has it at all. Some of you will remember that this time last year the Alice House had a similar issue with their decking. It was a bit different though, as it was clear it was on their curtilage and the issue was more about the height of the decking. 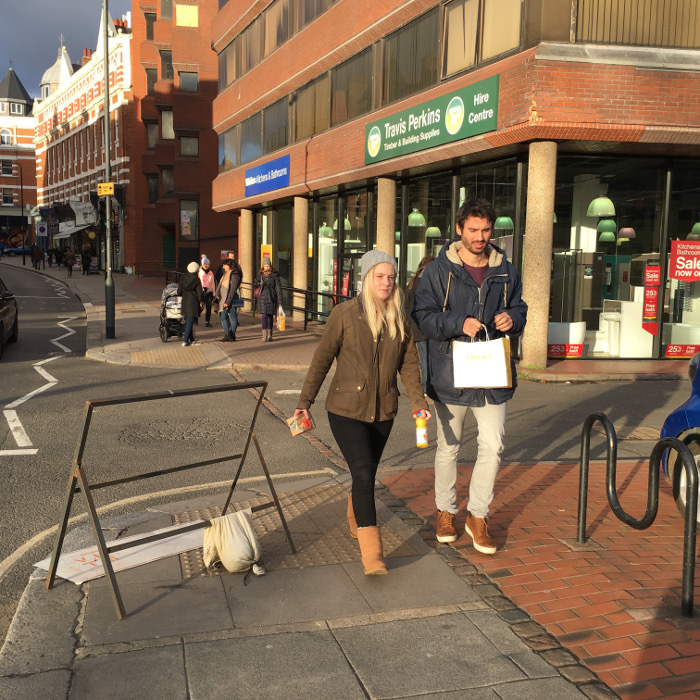 Further up West End Lane, there was a particularly egregious example of a creeping A-boards by Bobby Fitzpatrick, right in the middle of the pavement! Naughty. You can see how Bobby’s has put chairs and tables out on their curtilage, just as its predecessor La Brocca did, but that A-board is as cheeky as a 1970s comedy. On the other side of West End Lane, Cedar restaurant too has decked out its curtilage but sometimes puts an A-board out too. 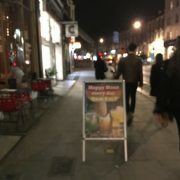 And right at the top of West End Lane, Schnitzel has three A-boards including one which narrows the zebra crossing. 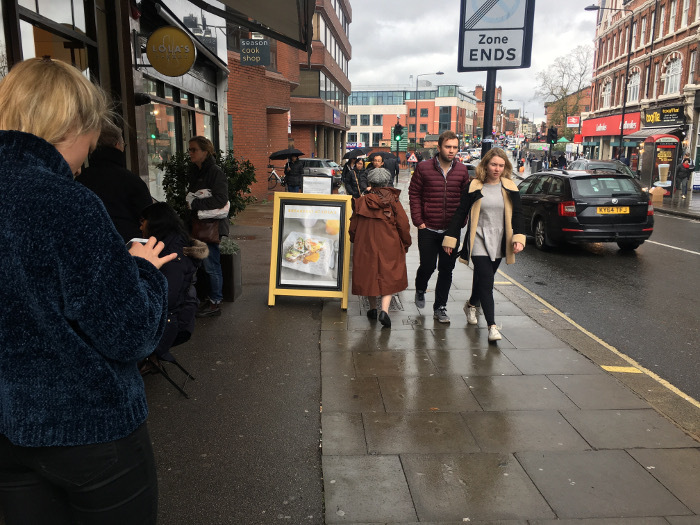 Back down West End Lane, Lola’s is a recent arrival and it has started putting out an A-board too – sometimes partly on the pavement. 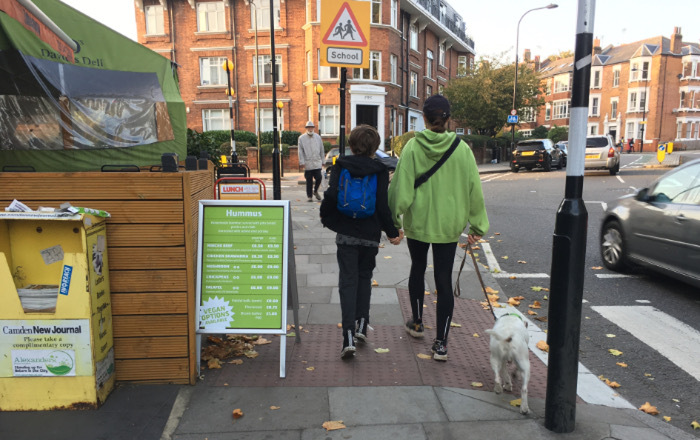 Even though it has a relatively wide curtilage, it still had to apply for planning permission to put out tables and chairs, but again it’s the A-board that causes the most disruption, particularly because the public pavement is relatively narrow and busy. There is good news here though, as a quiet word with one of the managers led to the compromise of putting the board as close to the planter as possible, which makes a significant difference. It’s not all bad news. Here’s an A-board nearly placed on a premise’s curtilage. 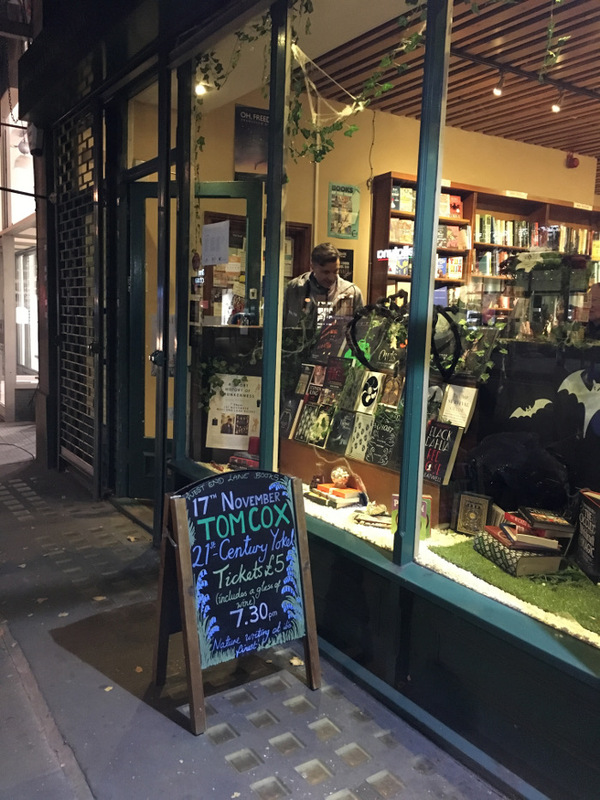 Gold star to West End Lane Books! Outside the library we looked at the planting and seating. It’s sad that this has been neglected since being installed a couple of years ago. Again there is a question of who is responsible for maintaining it. It was originally installed when the Lib-Dem/Conservatives coalition gave areas the ability to choose projects they wanted, and this was one. Indeed it was very popular in this NDF survey. So it’s shame it’s been neglected. 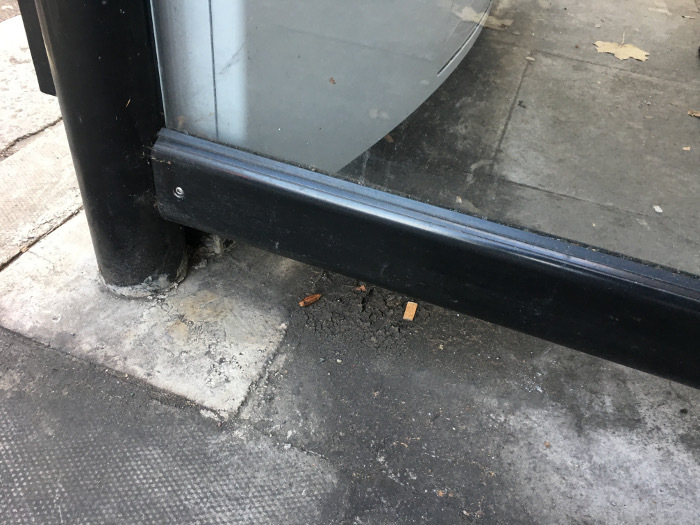 We also noticed that some of the bus stops and seats were very grubby with an accumulation of dirt that a good jet wash would deal with. If it hasn’t been done by early March, then maybe it’s something for the Great British Spring Clean on March 2-4, 2018. All in all, things weren’t bad (and better than the Kilburn High Road). But there is still room for improvement, though it remains unclear who is responsible for reporting the problems that do exist. 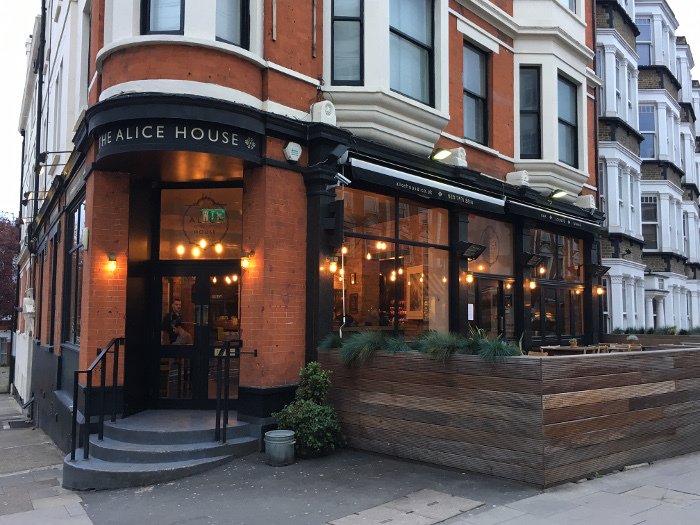 Popular West Hampstead bar, The Alice House, has fallen foul of Camden’s planners who have refused retrospective planning permission for its outside decking. The Alice House bookends a run of outside seating spaces along that stretch of West End Lane, which includes One Bourbon and The Black Lion. Together, many locals feel they make an attractive ‘active frontage’ that brings life to West End Lane. Decking in question, it appears to be within the frontage. Cllr Flick Rea, who has long experience of planning issues in the area, was surprised at the decision, particularly when there have been so many other blatant breaches of planning policy elsewhere in our area. However, many other similiar decking areas have been in place for more than four years, which means they become automatically approved. For example, The Petit Corée at 98 West End Lane has a raised platform that is more than four years old (pre-dating the existing business) and is therefore immune from prosecution. It also has a boundary fence that was lowered to below 1 metre, which is the maximum height allowed before permission is required. At the other end of West End Lane, Schnitzel has also had decking in place for more than four years and again no enforcement action was taken. Its fence is marginally higher than 1 metre, but it was not deemed expedient to pursue the matter. GBK, The Black Lion and Thunderbird (when it was La Smorfia) all applied for permission to retain or alter their outside decking areas and all were granted. Hang on, you may be saying, the decking at The Alice House has been there for more than four years. True. There has been a decked space outside the building for many years, certainly before ULG, the current owners, took over the site back in 2008. However, it is the improvements made over the past couple of years that have caused the problem. Alice and her problematic timber perimeter! Originally, the decking was separated from the pavement by just a rope barrier. Then, when the decking needed some repair work, the company though it would be a good opportunity to replace the rope barrier with something more fixed and incorporate some built-in seating. This has proved popular with customers, but not with Camden. The Alice House saw these as minor changes to existing decking so it didn’t occur to the owners to seek planning permission. 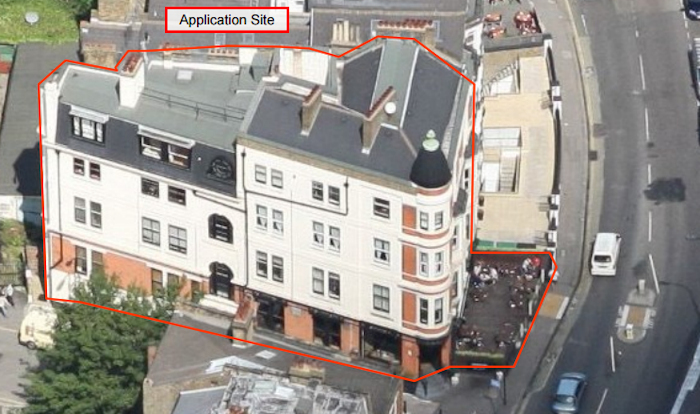 However, when a local resident alerted Camden to a string of planning breaches on West End Lane, including The Alice House, the planners suggested that the bar submit a retrospective planning application, which it did. Only one person objected during the consultation, arguing that the decking made the pavement too narrow – specifically for two buggies to pass each other. It is true that the pavement is narrow at this spot, though no narrower than elsewhere along this stretch. In fact, the precise boundaries of the public highway are not clear: the planning officer’s report states that the decking is on the public highway according to the Land Registry, but it actually seems to be within the line of the pavement along that stretch of West End Lane (as the photo below, taken from the application, shows), and ULG has a map from 1999 that implies the forecourt area is part of the property. 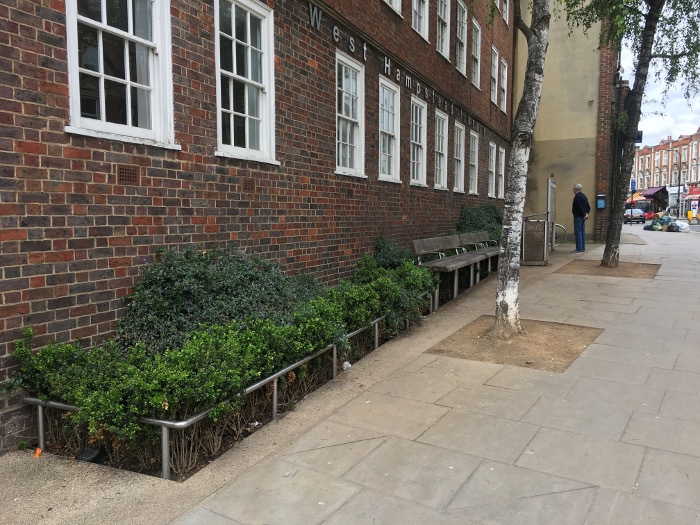 Camden’s objections to the decked area are that “by virtue of their siting on the public highway, [it] reduces the width and function of the pavement” and that “by reason of their size, siting and design, create a dominant and incongruous feature in a prominent corner location resulting in harm to the character and appearance of the host building”. 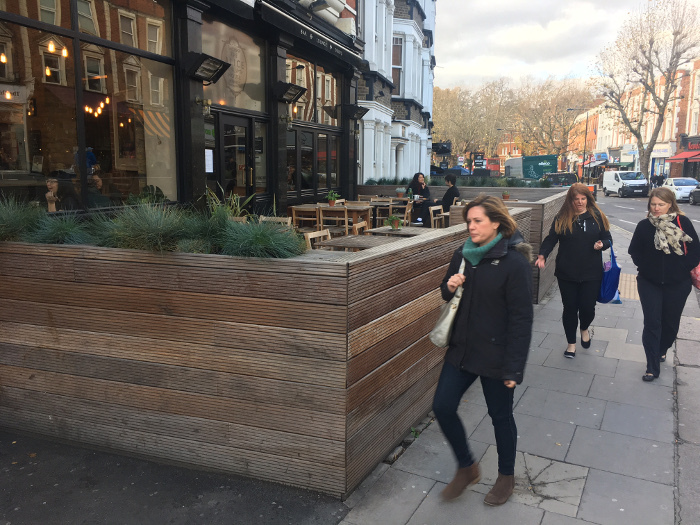 Camden proposed that the bar remove the planters (which are more than 1 metre high), and reduce both the height and depth of the decking, though offered no guarantees that this would result in permission being granted. Camden also wants to charge The Alice House a substantial sum, believed to run to thousands of pounds, as a table and chair fee, again claiming the decking is on the public highway. The Alice House in turn has proposed turning the clock back and reinstating the rope-barrier arrangement, which would have been automatically allowed under the four-year rule. Should ULG have been aware of the planning regulations on this? Camden’s planning website lists common issues for which businesses need planning permission, which include change of use, shop fronts and canopies but nothing about decking. 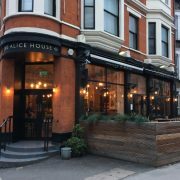 The Alice House is at pains to point out that it is trying to work with Camden to resolve this, and as a long-standing business in the area it wants to do the best for West Hampstead. Its advisors have suggested that it appeals the decision, which it intends to do. It would seem that much hinges on whether the space is or is not part of the public highway. And on Twitter, people have been voicing their support for The Alice House. @WHampstead I quite liked it. I never found it difficult to walk past it. Do we know the reasons cited in the refusal? What do you think? Is The Alice House being made an example of compared to some other less popular and possibly more egregious flouting of planning guidelines? Or is it right that planners try and uphold their own policies wherever possible?